Clackamas, OR (9/2/2008) – Warn Industries has gone from a small shop in the Pacific Northwest to the worldwide leader in off-road products and accessories. To celebrate the company’s 60th Anniversary, WARN® is releasing a limited-edition version of its iconic M8274 electric winch, called the M8274-60. For decades, the M8274 has been a favorite of off-road enthusiasts because of its fast line speeds, extra-long rope, and exceptional durability. The limited-edition M8274-60 will have all of these renowned features plus some unique upgrades including: 150’ of lightweight synthetic rope with a versatile 360-degree swiveling hook; a polished-aluminum hawse fairlead; a sealed contactor for outstanding reliability; a revised metal clutch lever; and a powerful new 6.0 hp. motor with cooling fins. The winch will wear a black powder-coated finish and have commemorative WARN 60th Anniversary badges. Only 250 units will be produced, each one individually numbered. 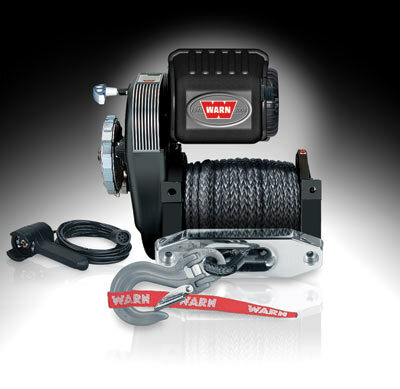 WARN will be placing one of these winches up for bids at the SEMA Silent Auction at the 2008 SEMA Show in Las Vegas. Auction donations will benefit the SEMA Memorial Scholarship Fund.